On the beach promenade between El Palo and the city center the fish restaurants are lined up and often side dishes such as boring salads, French fries, fried aubergines or peppers are the only vegan options. 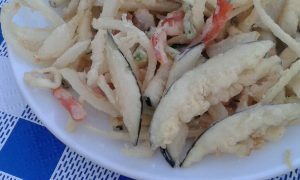 Some fry only vegetables for the typical “Fritura de Verano” for you, but you should ask which oil they use for it. In addition, there are the difficulties of Spanish dining, most of the restaurants are closed between 5 pm and 8 pm. There are, however, a few exceptions mostly Sandwiches, Burger and Salads, which I describe here. 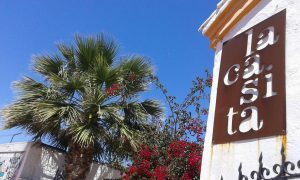 I start with a virtual walk from El Palo, where the Yoga-Homestay is located, into the direction of the city center. Click on the Links for google maps for more information about the location, opening hours and their webpage. On the far east of the city, there is a bistro between all the fish restaurants, open all day. They serve a selection of vegan fastfood in the deluxe version: burger, burrito, hot dog and a seitan sandwich, as well as “build-your-own”salads. Appealingly served and right by the sea. Top-Tip: Instead of fries you can go for a side-salad. That makes the “fast food” a bit healthier. My favorite breakfast place in El Palo, just before the bridge to Pedregalejo. Here you can have breakfast all day! As a vegan variant, I recommend tea, freshly squeezed orange juice and the cereal-bread with olive oil and tomato. In the summer months, as La Casita is only open in the afternoon as a bar, there are only drinks, but then you are welcome to bring your own food! In case La Casita is closed or you´d like to try another place, I recommend an Italian restaurant for breakfast. It is only 2 min. walk away, in the Echeveria del Palo. 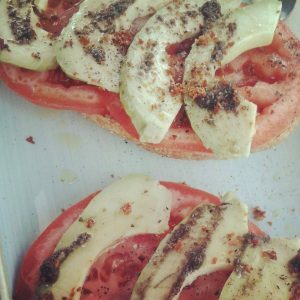 Here you can enjoy soy sauce and a grain bread with tomato, avocado and black olives with herbs. Obviously there is also vegan pasta. The restaurant owners are a lovely German-Spanish couple. You can just ask and they will make your meal vegan if possible. Also located in the Echeveria del Palo opened a new restaurant opend with “build-your-own” Salads, Burgers and Poké. This is the perfect place to eat with everyone. The vegan Burger Patty is made of Quinoa and Bell Pepper and they even give an ecological bun as an option to choose. I didn`t know “Poké” before, apparently it is a kind of a sushi in a bowl, a japanese hawaian fusion. Don`t forget to add some seaweed for the typical “sushi” taste in your vegan choice. The decor is fresh and young with bright wood and turqouise elements. So glad to have this place around my corner. For Food on the Seaside I recommend La Galerna. The first bistro to serve Soy-Milk with your tea or coffee. Here you can have everything “build-your-own” style: Your Breakfast, Juices, Salad and Burger, similar to OHANA Poké & More. La Galerna is an absolute hotspot in Pedregalejo, so it can happen that you need to wait for a place. You can pass the time with a drink in your hand at the place “to see and be seen”. Another plus is, that the kitchen is open all day. 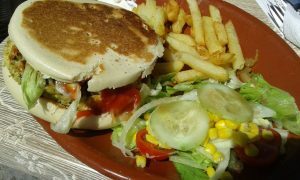 This popular “Hamburgeseria” in Pedregalejo has included a selection of vegan Burgers as well as soy kebab on its menu. Convenient fast food for Spanish food in a lively square by the sea. Info: No waiter service, you need to go to the counter to order and pay for your food. Then you get a number and when this is called out you shout: Here! So you can imagine, this is a rather noisy place. but if you like to have a local feeling, this is your place to be! The latest opening in the Burger-Movement is named “La Calle”, which means “Street” in Spanish. 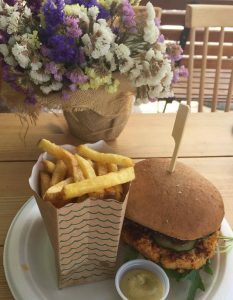 The former fish-restaurant is completely renovated and comes with three different vegan Burgers: Spinach-Chickpeas, Lentil-Curry or Portobello with homemade fries. 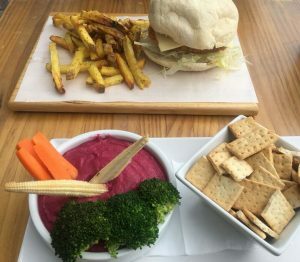 As a starter I can recommend the Beetroot-Hummus with Vegetables. You can sit outside and enjoy the sun but there is also the possibility to use the first floor with great views to the sea. 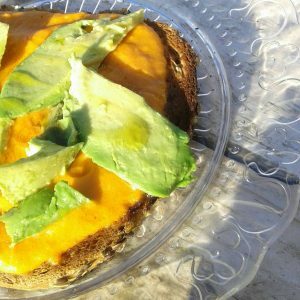 In case you are on a “Burger-Mission” and you´d like to find out, where to eat the best vegan Burgers in Town, these ideas on Málaga´s East Coast-Side might help you fulfil it. 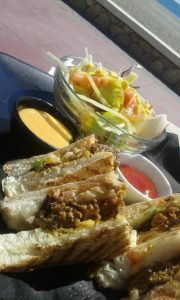 If you prefer more variety follow my guide for Restaurants and Shops for Vegans in the City-Center of Málaga.